Oh, Alejandro González Iñárritu, well-played. You've practically made Birdman a dare to critics not to roll their eyes at you. The setup is clear enough: Actor Riggan Thomson (Michael Keaton)—a veteran movie star forever linked to the superhero character he brought to the screen more than 20 years earlier—is taking a stab at making himself relevant again. He's thrown most of what remains of his money at producing a Broadway adaptation of a Raymond Carver story for which he has adapted the script, directed and cast himself as the lead. It may be his last, best opportunity to revitalize his career—and the previews are offering the distinct possibility that the whole enterprise is destined for disaster. This puts Birdman in the fine tradition of classic backstage farce—and at times it's a hilarious addition to that tradition. When a falling stage light knocks out one of Riggan's co-stars, he turns to Mike Shiner (Edward Norton)—a gifted but legendarily difficult actor whose girlfriend is another cast member, Lesley (Naomi Watts)—as the replacement. Riggan's own girlfriend, Laura (Andrea Riseborough), is also part of the cast—and she may be pregnant. Meanwhile, Riggan's high-strung agent/attorney (Zach Galifianakis) attempts to keep the production afloat, and Riggan tries to keep an eye on his daughter, Sam (Emma Stone), who's recently out of rehab and serving as his personal assistant. Iñárritu and his three co-writers—including his Biutiful collaborators Nicolás Giacobone and Armando Bo—get their best material out of the contentious relationship between Riggan and Mike, who come at the inevitable business of artistic insecurity from very different directions. And the filmmakers have fun exploring the radically new nature of contemporary fame, as Riggan finds instantaneous renown beyond anything a play could provide when he's locked out of the theater while not fully dressed, and video of him marching through Manhattan in his tighty whities goes viral. But Birdman isn't content to be a Noises Off! for the social-media age. Anybody who's seen Iñárritu's previous films like 21 Grams, Babel and Biutiful knows he has a fondness for the operatic gesture and weaving multiple individual storylines into an attempt to share Big Ideas. He goes big right off the bat with his concept for the visual storytelling of Birdman, so that it appears to be one continuous shot even as it spans the events of several days. It's a virtuoso trick, but it's one that seems to exist only to call attention to itself. 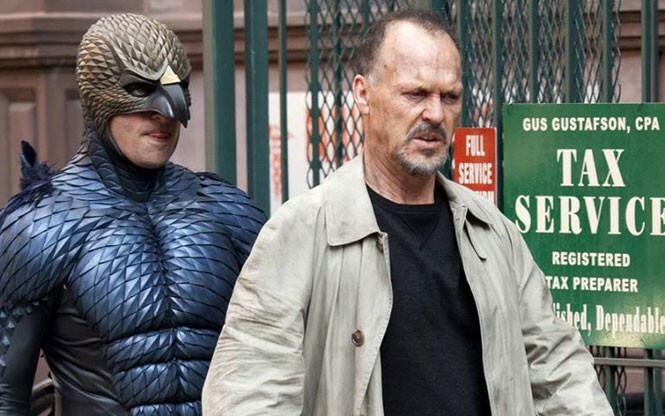 While part of Birdman's premise is ultimately redeeming Riggan's involvement in the uniquely magic-making business of movies—one extended sequence finds him imagining, or perhaps not imagining, an action-movie set piece breaking out all around him, and himself soaring majestically through the skyscraper canyons of the city—the act of looking for the seams in cinematographer Emmanuel Lubezki's 100-minute-plus tracking shot becomes a distraction rather than an enhancement. And then there's the scene in which Riggan squares off in a bar with the New York Times theater critic (Lindsay Duncan) who has announced her determination to destroy Riggan's play, sight unseen. While Riggan's precarious emotional state certainly increases the likelihood that he'd lash out at someone who holds his career in her hands, Iñárritu drags out the moment to become something that's less intrinsic to Riggan's character and more of an excuse for the filmmaker to rant. Stopping your movie dead to attack critics isn't exactly the way to show you understand what flourishes can be aesthetically frustrating. The biggest frustration, though, is that Birdman is so often fundamentally entertaining in the moments when it's not posing to be admired. Keaton's performance works beyond its wink-and-a-nod to his own Batman history, and there's even stronger work by Norton and Stone finding their own characters' vulnerabilities. It's often funny and crazy and perceptive about the terrifying business of being an actor, even one who has become famous. But there's a visible strain to be something more profound about capital-A Art, and a dare not to cringe when a man on the street screams the celebrated Macbeth line "... full of sound and fury, signifying nothing." If Riggan can come to terms with the idea that it's okay for movies just to make people happy, maybe Iñárritu could get to that place, too.